Every year on the last day of the Festival of Carnival people all over the world prepare for one of the biggest parties ever. This party is what we all call Mardi Gras or Fat Tuesday. Traditionally, it signifies the entrance into the fasting days of Lent for all those of the Catholic faith, but its also just a great excuse for a massive party. While many think the real action happens way down in New Orleans, its probably just because theyve never made it out to the annual Folly Gras festival and parade on Folly Beach. Each year before Mardi Gras, Folly Beach shuts down the already bustling Center Street and kicks up the pace by turning it into a street fair full of New Orleans style food and drinks, dancing, activities, art, music, and a parade. With all the festivities going on, party-goers will think theyre down on Bourbon Street in the Bayou. In keeping with the celebratory atmosphere, visitors are encouraged to come in full Mardi Gras regalia by wearing face masks, beads, and costumes to celebrate on the street. Masks and beads can be purchased at City Hall. 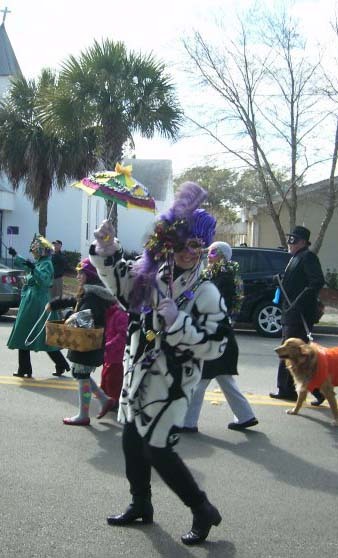 In addition, the public is welcome to take part in the parade as long as theyre dressed to the nines -Mardi Gras style. To be in the parade, participants need to meet on West Arctic Street in front of the Tides hotel at 1:30 p.m. to prepare for the 2 p.m. parade. Vehicles are also allowed in the parade, but they must be fully decorated to cruise Center Street. Trophies will be given out for best float, costume, and food. While the streets are bustling with people of all ages enjoying the street fair, local bands Gaslight Street, Guilt Ridden Troubadour, Shakin Martinis, SoulFish, and Elise Testone and the Freeloaders will be rocking out for your enjoyment. The Folly Beach Art Guild will also have their work on display in the vicinity. The actual event is scheduled to last from noon until 5 p.m., but no die-hard Mardi Gras fan will stop the party before the shank of the evening is underway. After celebrating all day long on the street, keep the party going by visiting one of the many bars and restaurants on Folly Beach. So come out to Folly Saturday, February 26 and be ready to get your party on. who can we contact about playing music for this event in 2012?